I recently received a question about real estate appreciation rates for Northeast Tallahassee and decided to use my answer for today's blog. As you might imagine, different property types may or may not perform the same, so I have restated the question to cover condominiums, townhouses, and single family homes in NE Tallahassee. The answers were a little bit surprising. It should be expected that property values rise and fall based upon supply and demand, and we know that the demand for different property types varies greatly. In Northeast Tallahassee, we tend to see most home buyers seeking single family detached homes, and thus that has been the predominant type of property built there. Our real estate graph shows the one-year trend of home values for single family detached homes (red line), townhouses (green line), and condominiums (blue line). Single family detached homes appreciated 6.8% from the beginning to the end of 2013, while condominiums showed an even greater rise at 9.8% growth. But townhouses fell 7.7% in value and still appear to be declining. This peaked my curiosity, and I wondered why townhouses would perform contrarily to the rest of the market? I figured I might find the answer by looking at foreclosures, short sales, and bank owned properties that sold last year. It turns out that 17.1% of all single family home sales in Northeast Tallahassee were distressed properties in 2013, compared to 24.1% of the condominiums that sold, while a whopping 31.1% of all townhouses were distressed sales. I believe we will see values return as fewer distressed home sales pass through the market. The number of condominiums is few in Northeast Tallahassee, and that is why we see such chaotic results (compared to single family and townhouses). The majority of condominium sales are from just one condo complex, and its recent history has more to do with the changing values than does other market factors. 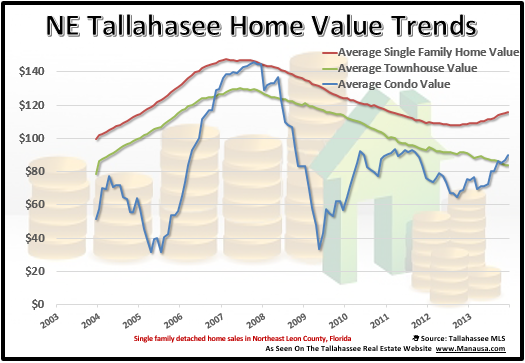 Overall, when lumping all the property types together, home values rose 5.2% in the northeast quadrant of the Tallahassee real estate market in 2013, and I would expect to see them continue to rise again this year. If you would like to know the real estate appreciation rate for homes just like yours, simply drop me a note and we will schedule a time to review your property and its value in the market today.